Carnival Cruise Line has issued an urgent weather alert to guests booked on the Carnival Fantasy February 4 sailing. UPDATE: The weather has improved and Carnival Fantasy is now expected alongside the cruise terminal at Port of Mobile by 2:00 PM. The cruise line has issued a weather warning for those booked on the February 4 sailing out of Mobile, Alabama on Carnival Fantasy. Due to heavy fog the port has been closed which means cruise ships are unable to depart or arrive and this includes the Fantasy class cruise ship. Due to dense fog, the Port of Mobile is currently closed to all marine traffic. We will continue to monitor the weather conditions and provide you with an update by 9:30 AM (CST). Please do not proceed to the cruise terminal until you receive our final update. If you haven’t already done so, please sign up for text alerts by texting CCL1 to 278473 (CRUISE). 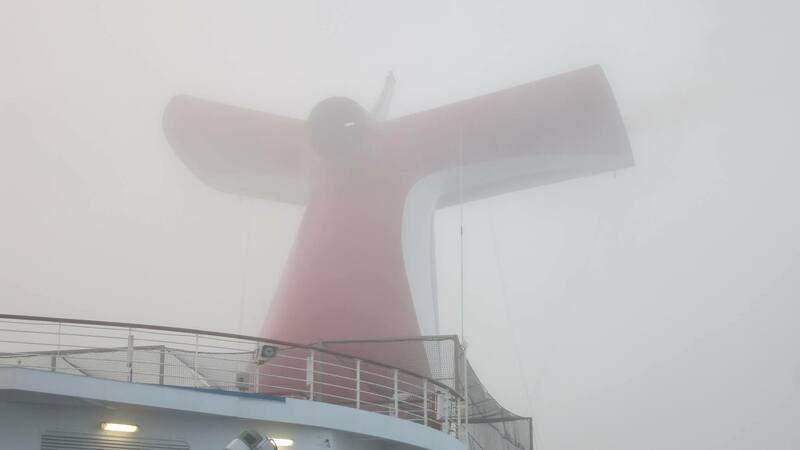 Carnival Fantasy is scheduled to arrive into port at around 8:00 AM but the fog is delaying the ship. It all depends when authorities give the all clear for the port to re-open again. More updates on the ship arrival will be announced shortly. With Carnival Fantasy being delayed due to heavy fog it does have an impact on guests on the current cruise and those booked for the next one. Passengers who have booked early flights will have to make alternative arrangments as by the time the disembarkation process has completed there will be an impact on travel back home. Passengers booked on the next sailing will just have to wait at their hotels or somewhere nearby until Carnival Cruise Line allows the embarkation process to begin. Usually, in these cases, there will be an updated embarkation time via text alerts. Carnival Fantasy which is the oldest ship int he fleet is coming to the end of a 4-night western Caribbean cruise. The vessel was originally scheduled to depart the Port of Mobile later at around 4:00 PM for another 4-night Western Caribbean cruise with a call at Cozumel, Mexico. Unfortineuty fog hitting cruise ports is a common thing. The port of Galveston has been closed forced to close many times over the years due to fog, and the same goes for Port of Tampa in Florida. The Carnival cruise ship is 70,370 gross tons and has a guest capacity of over 2,000 at double occupancy.